Formula 1 bosses have agreed to ditch the controversial double points rule. It was introduced for the final race of 2014 to keep the championship alive for as long as possible but was criticised by drivers, teams and fans. The agreement needs ratifying at a meeting of the FIA World Motor Sport Council, but F1's legislative body is expected to rubber stamp it. The idea of F1 boss Bernie Ecclestone, the double points rule was criticised for being unfair and artificial. As it turned out, the outcome of the 2014 championship would have rested on the final race even if double points had not been in force. 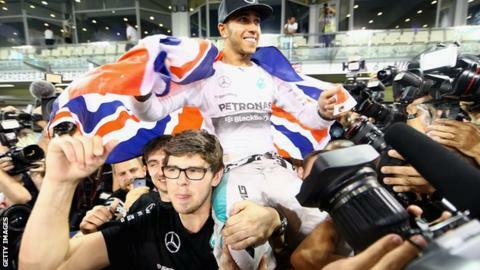 Lewis Hamilton was 17 points ahead of Mercedes team-mate Nico Rosberg going into the season-ending Abu Dhabi Grand Prix but made sure of the title by winning at Yas Marina. That gave the Briton a further 50 points, leaving him 67 in front of Rosberg, who came home 14th after suffering car trouble. Ecclestone and FIA president Jean Todt met with representatives of the teams, circuits and sponsors to discuss a number of proposals at this week's meeting, not just the double points rule. The BBC has learned that they abandoned plans to introduce standing re-starts following the deployment of the safety car but failed to come up with any formal proposals aimed at keeping costs under control. The issue of costs remains a hot topic following the financial collapse of the Marussia and Caterham teams. Force India, Lotus and Sauber have also complained that they are struggling financially because the split of prize money is not equitable. There was also no agreement on allowing limited in-season engine development. Currently, the rules allow a specified amount of development between seasons but none during the championship. Red Bull and Ferrari have been pushing to allow an extra stage of development in the summer. Mercedes are against the idea but have offered to accept a limited amount of development. However, their compromise proposal has been rejected by their rivals on the basis that it does not go far enough. Unanimous agreement is required to change the rules for next season. The World Motor Sport Council, which meets in Qatar on 3 December, will also hear from the investigation into the accident at the Japanese Grand Prix that left Marussia driver Jules Bianchi with severe head injuries. The investigation was charged with establishing what happened and coming up with new measures to reinforce safety at circuits.